It seems that we’ve been hearing about Intel’s next-gen CPU architecture, codenamed Sandy Bridge, for the past year, and previewing motherboards and revelling in the leaks for at least four months. In fact, it reached the point where we’d said ‘Sandy Bridge’ so often in the office that it started sounded stupid – Intel’s coming in to show us its Sandy Bridge? Wouldn’t a medical professional be more appropriate, we’d joke. However, that all ended soon after we received our first CPU samples in November and started our own testing. Our conclusions? The Sandy Bridge CPU range is incredible, and has the potential to change the entire PC industry. Intel hasn’t helped at all to convey the significance of its new line-up – the range is still branded Core i3, i5 and i7, making it hard to know whether it’s new at all. The Internet has also been awash with rumours that Sandy Bridge won’t overclock at all, or that it’s so easy to do so and the CPUs are so fast that Sandy Bridge will make the LGA1366 Core i7 range redundant – not bad for a mid-range, mid-priced CPU. There’s a lot to explain when it comes to the new Sandy Bridge range, so we’ll endeavour to blow away the myths and deliver the facts as clearly and concisely as possible. Intel is calling Sandy Bridge its second-generation Core architecture, which is wrong. The first Core-branded CPU was a laptop-only CPU based on the Yonah architecture of early 2006, followed by Conroe and its mobile equivalent Merom, which was sold under the Core 2 brand. Ignoring the Conroe update that was Allendale, manufacturing process shrinks of Wolfdale and Penryn, and the Core 2 Quad CPU designs, Intel should have realised that Nehalem counts as a new architecture. 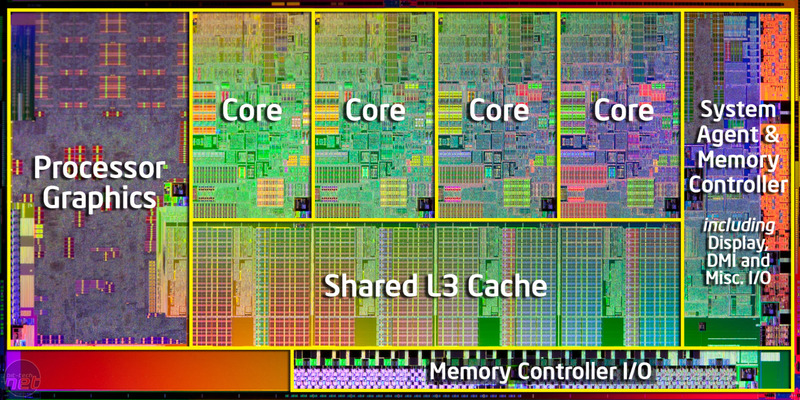 We therefore reckon that Sandy Bridge is Intel’s fourth genuinely new Core architecture, not its second. It’s scandalous that Intel should throw away the excellent pedigree of the Core brand by not recognising this. The lower line shows the new logo for the Sandy Bridge range – the brand is cracking apart to reveal the underlying technology, rather than peeling off as before. As Intel is erroneously calling all its Sandy Bridge CPUs its second generation of Core CPUs, every model name starts with the number ‘2’. You can also recognise a Sandy Bridge CPU by the four numerals in its model number rather than three, and any CPU with a ‘K’ at the end of its model number as a practically unlocked multiplier (it caps out at 57x, which is plenty for almost every possible use).